Hope you had a fabulous weekend. It’s been hot, hot, hot here and I was able to go kayaking on Whiskeytown Lake Saturday night; a wonderful evening paddle under a full moon. Heaven! But on to today’s post. Pedialyte/Gatorade that I wanted to share with you. I volunteered years ago at a wildlife rehab organization and we used this recipe for stressed out, dehydrated fawns and such that were brought in for fostering. I have also given this to my children when they were sick and getting dehydrated due to diarrhea and vomiting. It’s simple to make, cost-effective, and works! Mix well and store in the refrigerator for up to 4 days. You can drink as is, or add some Kool-Aid mix or maybe some Crystal Light for better flavor. Thanks for stopping by Two Dogs. 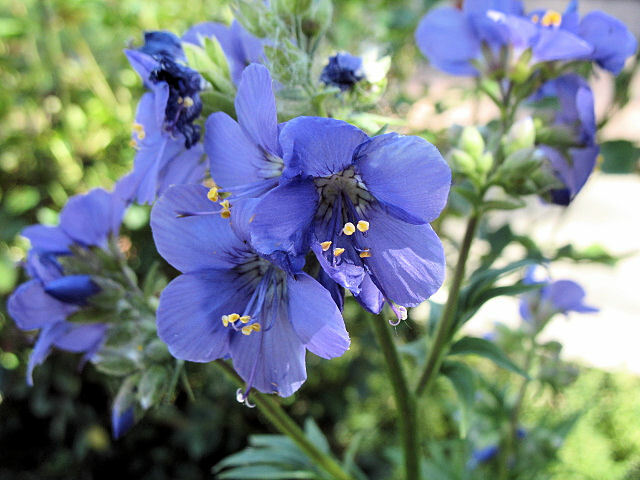 I leave you with a picture of my Jacob’s ladder that is blooming so beautifully. Have a great week!